Shelby Fredericks makes a move. The senior attacker will lead the Cats as they prepare for a potential rematch with Maryland in this weekend’s Big Ten Tournament. Northwestern (13-4, 5-1 Big Ten) rolled to its best regular season since 2015, but it ended with yet another disappointing loss against powerhouse Maryland. With a rematch against the Terrapins likely in this coming weekend’s conference tournament and the possibility of hosting an NCAA Regional on the line, The Daily’s lacrosse writers convened to discuss this critical juncture in the season. 1. What made this year’s team more successful than the past two, which both finished 11-10? Ben Pope: The Wildcats are both playing at a faster pace and converting more efficiently in 2018, a combination that has unsurprisingly led to great improvement. Increasing sample size is a fantastic way to take advantage of superior talent, and NU is clearly doing that this year, taking 3.2 more shot attempts per game but also conceding 1.4 more attempts by opponents. Goalie Julie Krupnick has made sure that increased pace hasn’t led to more goals against, however, with her .471 save percentage significantly outperforming 2016 and 2017 starter Mallory Weisse’s .419 and .432 marks. And on the offensive end, Sheila Nesselbush’s transformation into a star, leading scorer Selena Lasota’s return to full health and Holly Korn’s emergence have forced defenses to (try to) cover a wider variety of weapons. Ella Brockway: By the numbers, NU’s offense is one of its strongest in recent years. The Cats are averaging the most goals (15.24) and shots (32.8) per game since 2010, and their shot efficiency (at 46.4 percent) is its best since the 2012 season. This offense goes beyond attackers Lasota, Nesselbush and Shelby Fredericks; it extends, and runs through, the young midfield. Freshmen Ally Palermo and Jill Girardi and sophomores Megan Kinna and Lindsey McKone work on both ends of the ball to make this team dangerous in transition. These players are a huge part of the reason why the Cats average the most assists per game in the Big Ten. 2. How can the Wildcats get over the hump against Maryland for the first time since 2012? Brockway: The Cats will need to start strong, and part of that will come by limiting fouls early on. NU committed eight fouls in the first 12 minutes of last week’s loss, giving Maryland opportunities to restart their offense; when those fouls were committed inside the eight-meter arc, they gave the Terrapins a free opportunity to score. Almost a third of Maryland’s total goals this season have come off of free-position shots. Three of those six early goals came from a free position, and the Terrapins went 4-for-6 on those shots in the first half. But the Cats’ defense held Maryland scoreless on all five of their free-position opportunities during the second half. 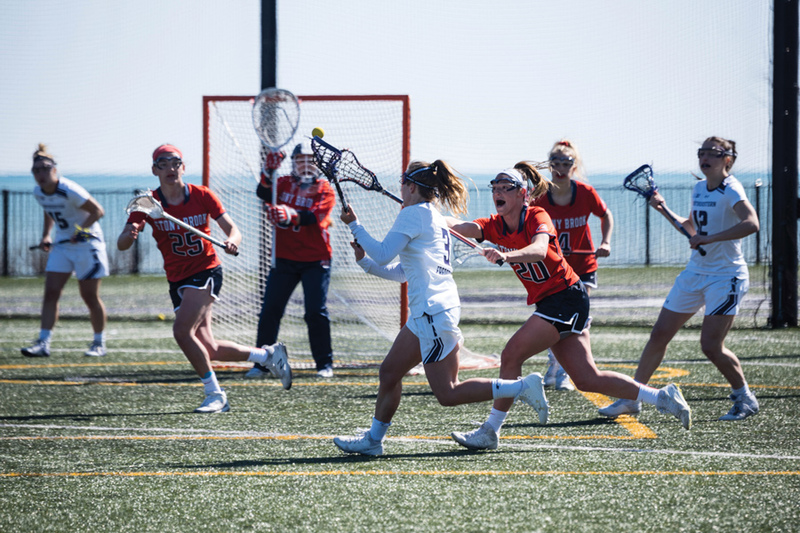 A strong opening free of early-game turnovers — the Cats were unsuccessful on three straight clears in a span of six minutes in the April 26 loss — would give the Cats a solid chance of taking down the Terrapins. Pope: Draw controls — almost always a strength of this Cats team — let them down in last week’s matchup against Maryland. In the 2017 regular season meeting, NU controlled 19 of 29 draws and still lost 14-6. Last week, NU won only 18 of 38 draws (including 9 of 22 in the first half), benched all-time career draw control leader Fredericks in favor of freshman Brennan Dwyer and still only lost 20-16. If the Cats can perform better in the circle, and take advantage of playing on a standard grass field and the lack of a hostile crowd at the Michigan-hosted tournament, they have the talent to keep up with the Terrapins. 3. How far can Northwestern go in the NCAA Tournament? Brockway: A win over Maryland in this weekend’s Big Ten Tournament could vault NU into a position as a No. 6 seed in the NCAA Tournament. The top eight seeds in the tournament will play their first games of the tournament at home, while the top six seeds receive a first round bye and have to handle only one opponent in regionals. Barring any upsets in the first- and second-round games, NU could matchup against No. 3 Maryland again or even current No. 1 Stony Brook in the quarterfinals. The Seawolves — who took home a 15-10 win over the Cats in Evanston on March 3 — are top-ranked in the latest polls, but their schedule in the weaker America East conference has historically led the selection committee to seed them lower than No. 1, and if they fall to the No. 3 seed, that could set up a rematch with NU. Whichever team is waiting in the quarterfinals, it’ll take a valiant effort for the Cats to make their first Final Four appearance since 2014. Pope: Although advancing past the quarterfinals will absolutely be a tough challenge, this NU team has both the depth and leadership to potentially do so. A third meeting this season with the Terrapins, especially if the Cats drop the second matchup in the Big Ten Tournament, would be the team’s most anticipated game in years.